Flamingo party favors are unique, will add to your flamingo decor, and are sure to be a hit at your flamingo party. Flamingo soap favors are also great as Florida flamingo party favors, flamingo wedding favors, and pink flamingo bridal shower favors. Includes tags. 2) Ribbon color - Hot pink, pink, white, etc. Ingredients: Glycerin (kosher, of vegetable origin), Coconut Oil, Palm Oil, Safflower Oil, Purified Water, Sodium Hydroxide (saponifying agent), Sorbitol (moisturizer), Sorbitan oleate (emulsifier), Oat protein (conditioner), Scent, Titanium Dioxide, Color/Iron Oxide/Mica. May contain FD&C/D&C/Lake colorants. 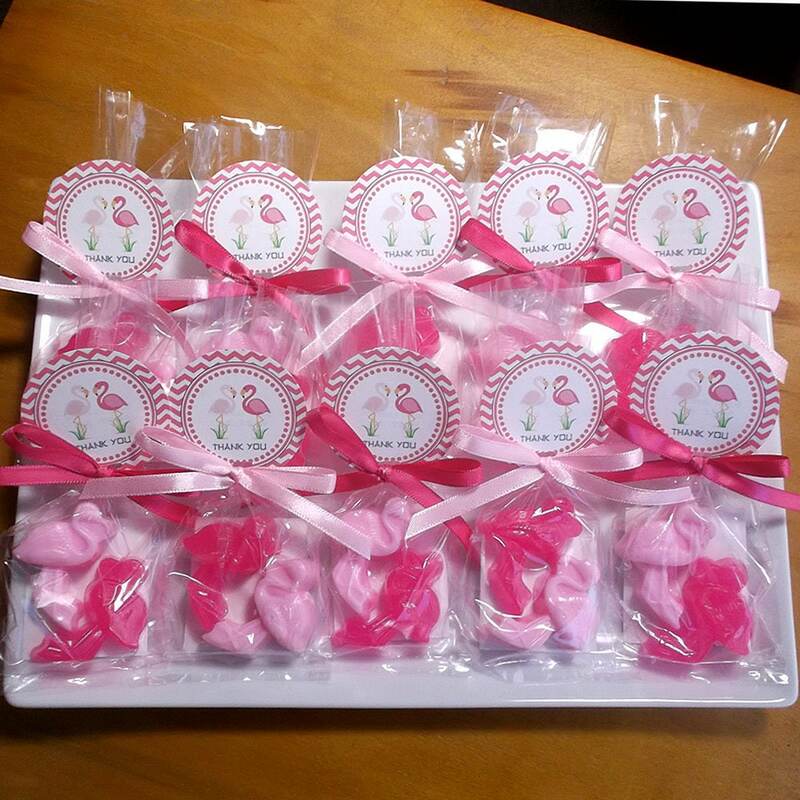 These flamingo guest soap favors are adorable! One can specify soap color(s), decorative ribbon and scent. The tag can also be customized. Please note the size as these aren’t very large but I think they’re perfect. I had them shipped directly to the party location so they wouldn’t add to our overstuffed luggage. From order to delivery: I am more than satisfied. Loved how they smelled. Very different & best purchase for shower gift.